Bring 1 1/2 cups stock, 1 tablespoon oil and the lime zest to a boil. Add the rice and stir, then reduce the heat to medium-low to simmer and cover. Cook for 15-16 minutes, then stir in the lime juice and chives. Turn off the heat and fluff the rice. Keep covered and warm on the stove until ready to serve. Meanwhile, for the chicken, heat the remaining 1 tablespoon oil in a large nonstick skillet over high heat. When the oil smokes, add the chicken and season with black pepper. Brown evenly, then remove to a plate. To the skillet, add the chili pepper, ginger, garlic and red bell pepper and stir fry for 2 minutes. Return the chicken to the pan. Stir together the hoisin, marmalade, Tamari and the remaining 1/2 cup chicken stock. Add to the pan and reduce over high heat for 2-3 minutes. Stir in the peanuts and scallions. Turn off the heat. Serve the chicken over rice in shallow bowls and garnish with cilantro, if desired. In Recipes-list.com we have selected the most viewed recipes from category - uncategorized . Enjoy the best recipes specially selected for you! 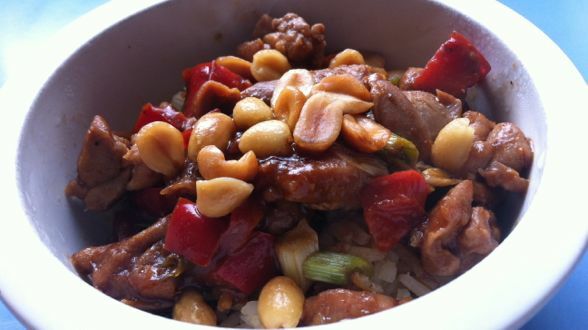 Asian Barbecued Chicken Stir Fry with Peanuts and Rice is the right choice that will satisfy all your claims.